Random House launches Big Little Golden Books with a quartet of vintage titles in a new, larger trim size. First published in 1942, The Poky Little Puppy by Janette Sebring Lowrey, illus. by Gustaf Tenggren, stars a curious canine who just can't keep up with the pack. In Scuffy the Tugboat by Gertrude Crampton, illus. by Tibor Gergely, Scuffy sets out to see the world but soon decides to go back where he belongs-the bathtub. It's springtime in Margaret Wise Brown's Home for a Bunny (1956), illus. 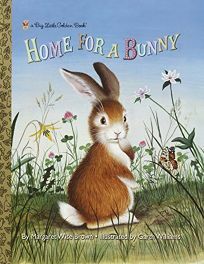 by Garth Williams, and a brown rabbit looks for a place to live. After interviewing other animals about their abodes (""I would fall out of a nest,"" he explains to the robin), he finally finds the right match. In The Fuzzy Duckling (1949), a counting book by Jane Werner Watson, illus. by Alice and Martin Provensen, a baby duck meets other animals including ""two frisky colts,"" and ""six lively lambs/ with thick soft fleece,"" but none will join him for a walk through the woods.